Charles and Beverley they worked together in an airline. 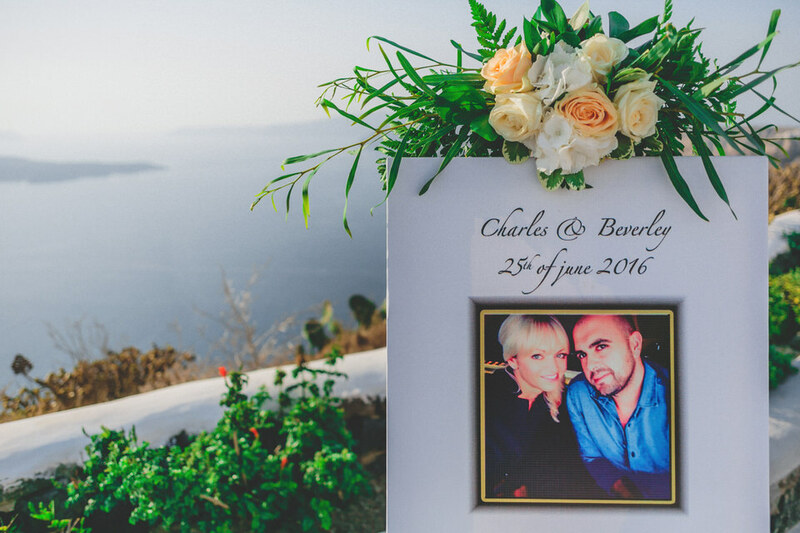 Love was in the air and Charles proposed to Beverley December 2014 in the world’ s tallest building - Atmosphere restaurant, Burj Khalifa, Dubai. 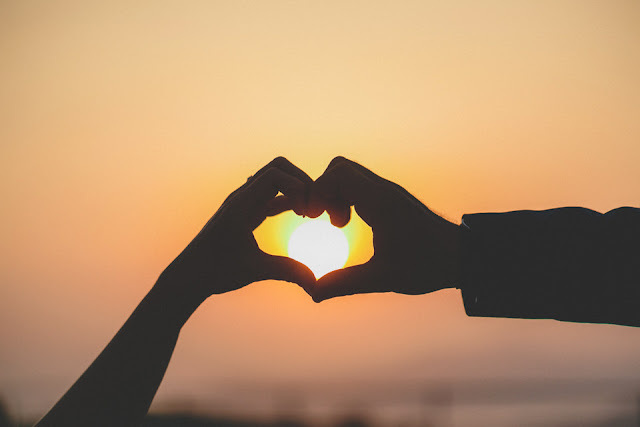 Beverley knew immediately that he was the one, the first day they met. 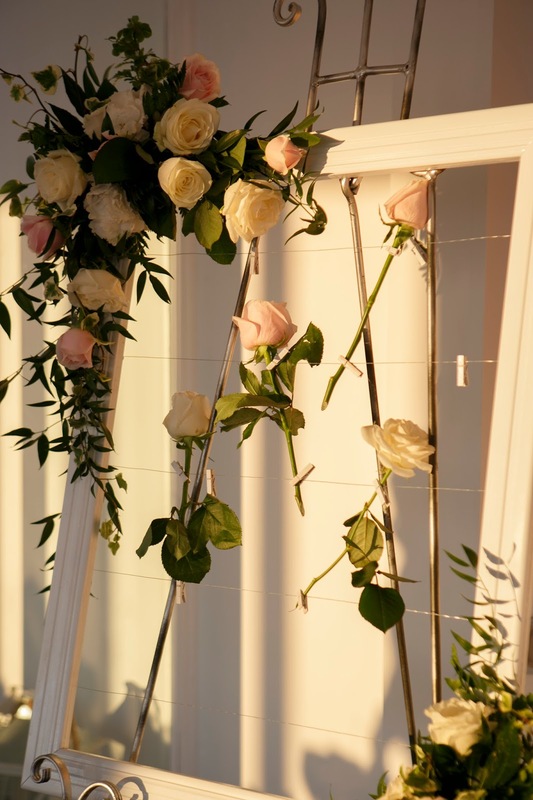 The length of the engegment was 1 year and 7 months . Our wedding planner Olympia suggested Ventsanos winery as we were looking for something special and very romantic. 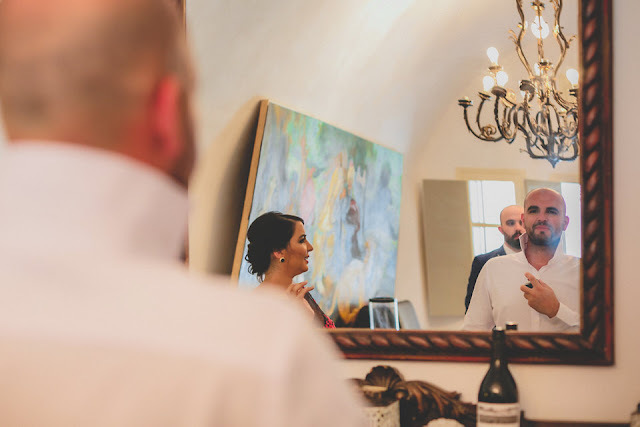 Olympia was our wedding planner from Marryme in Greece and we had long discussion about how we would like to be our wedding . 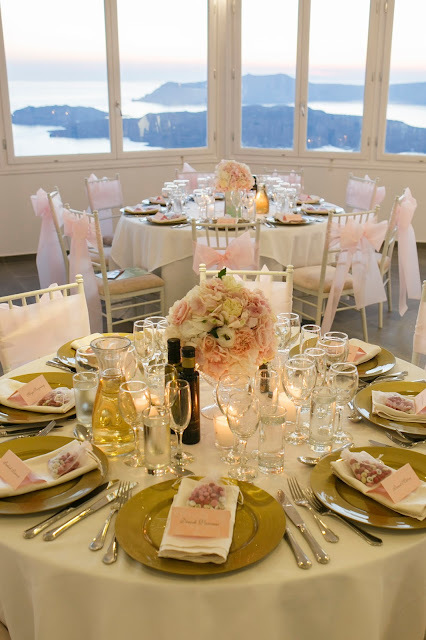 Olympia designed the wedding according to my dreams. She helped us organize everything, she put time frames for certain things, that need it to be done and finalized. 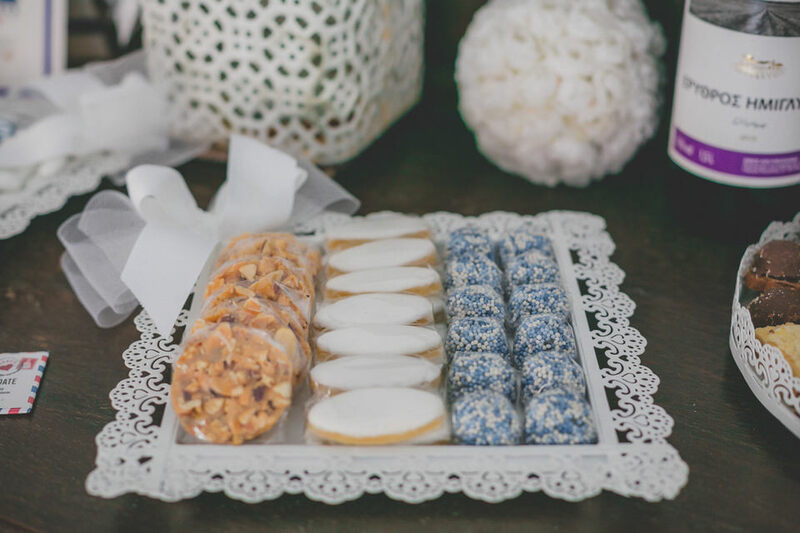 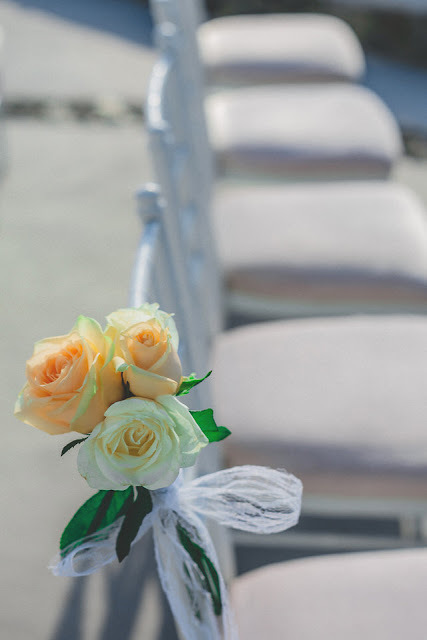 She suggested the wedding ceremony and location, all vendors such as florist, photographer, dj, catering and she ensured that the wedding day everything went according to the plan, which was sent to us nearly a month ago to be finalized and approved . 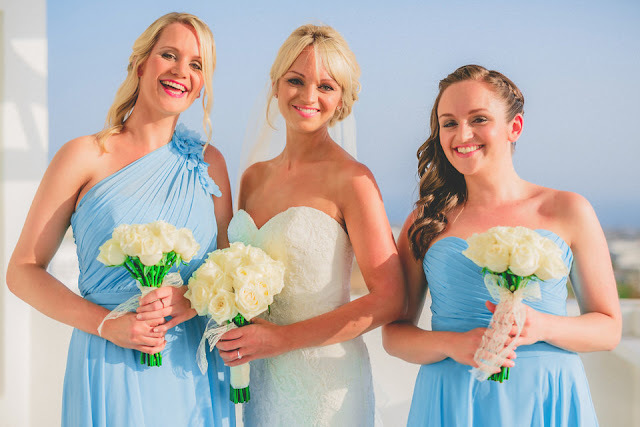 I had two bridesmaids and their dresses were Grecian style in bright light blue . 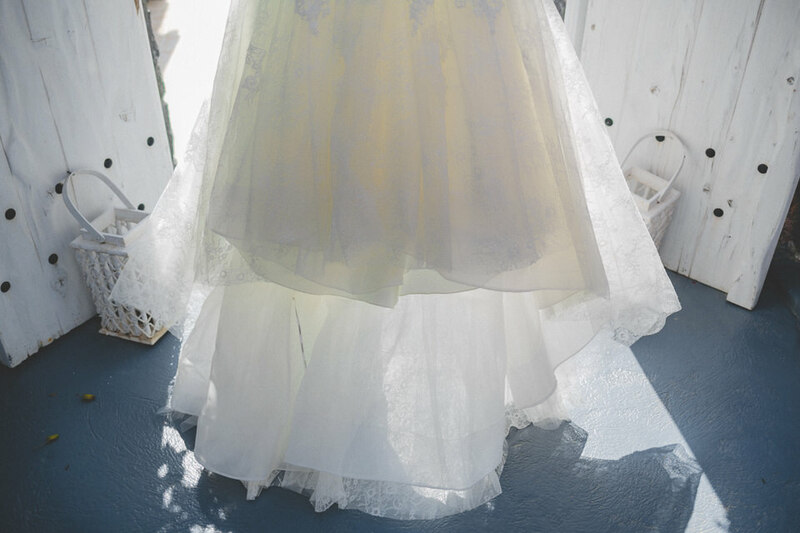 One of the bride maids wore strapless and the other one shoulder design of the same dress. 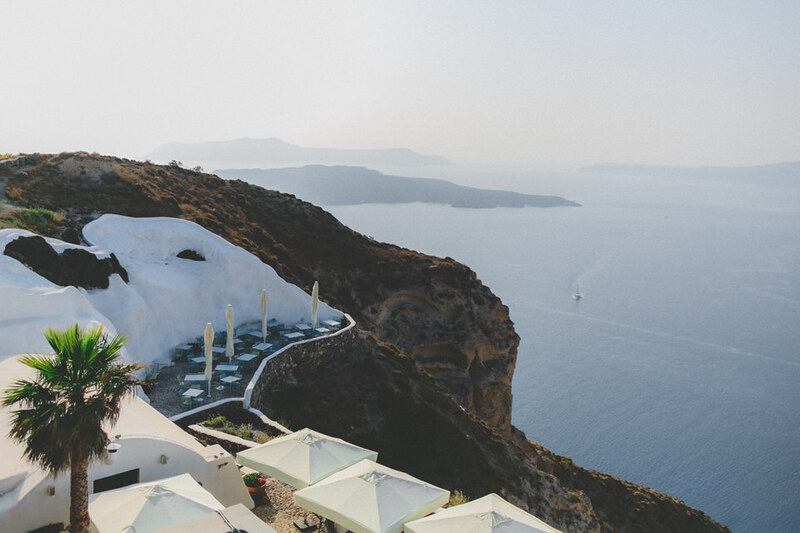 I picked the colour to go with the blue of Santorini and it’s my favorite color. 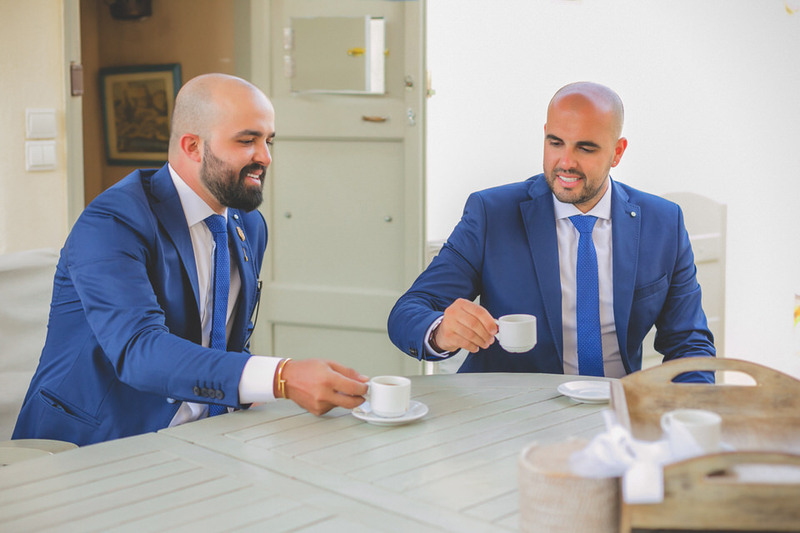 We also had two groomsmen Charles brother and the best man in dark blue suits. 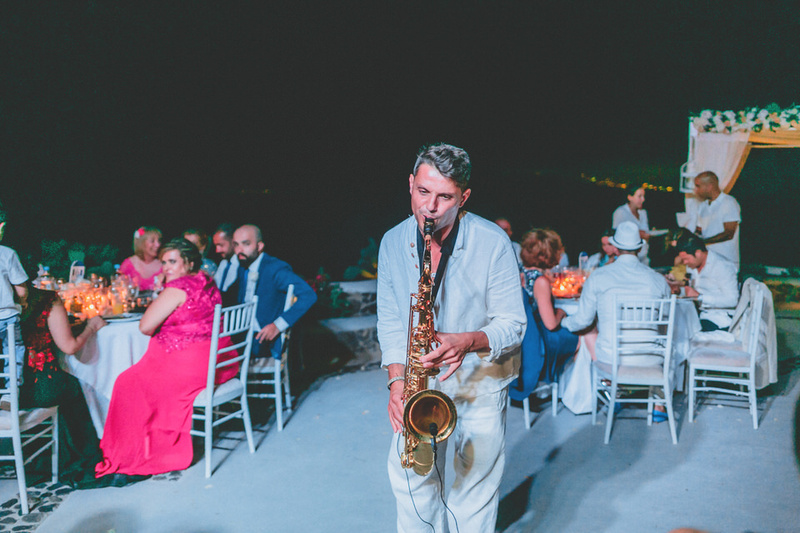 Certain things made our wedding unique, the location which was amazing, our wedding cake, the saxophonist and the fireworks Our wedding cake was Santorini inspired with a small church on top of this . 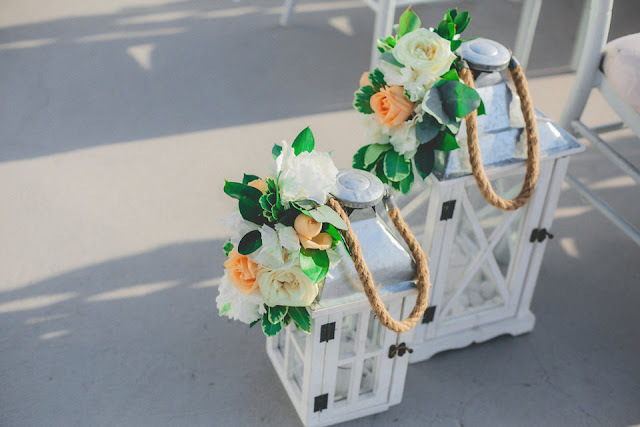 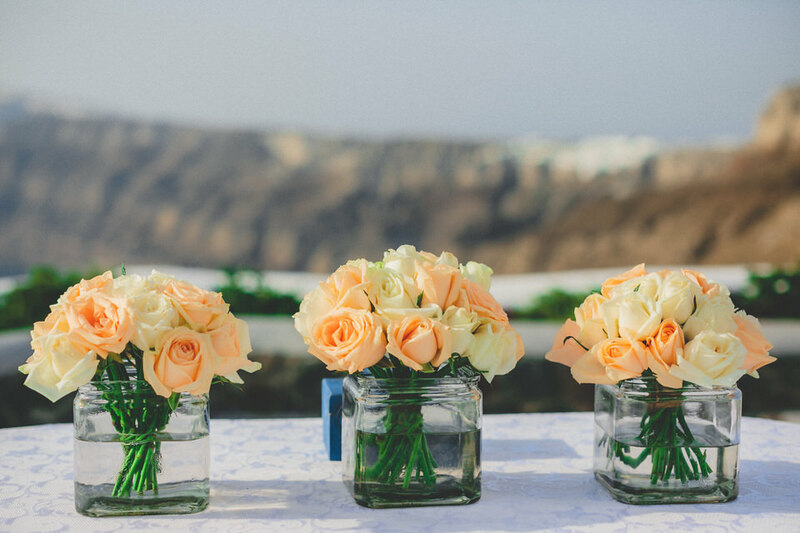 I wanted my wedding flowers to be simple, elegant , yet romantic and neutral. 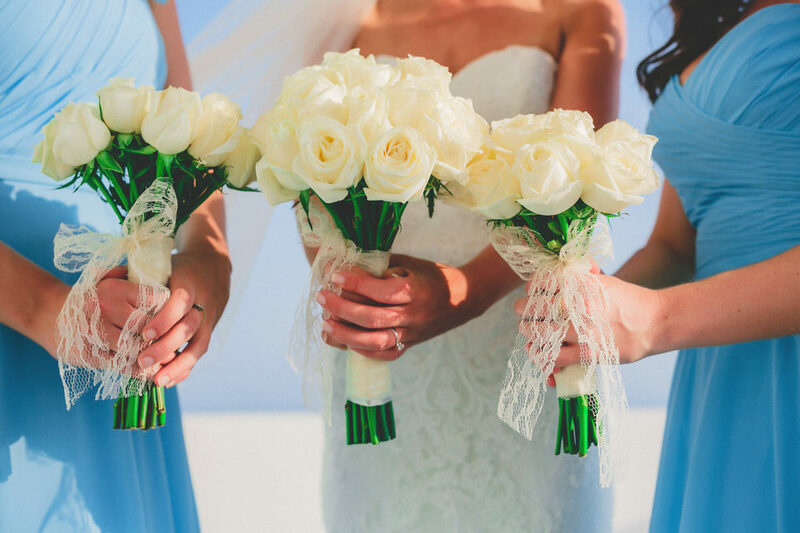 For this reason my bouquet was of white roses , the same for the brides maids and lace ribbon. 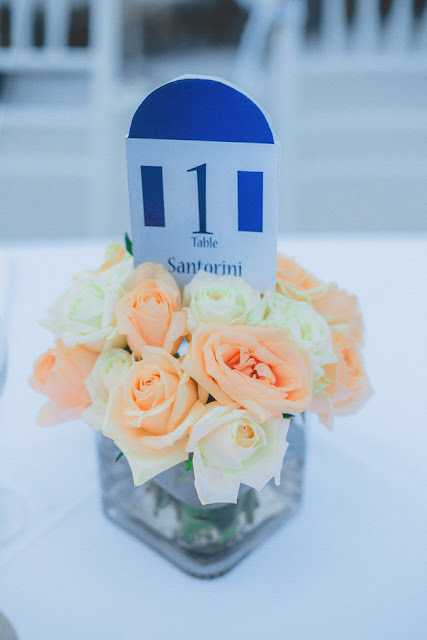 The rest of the flowers were off white and peach color. 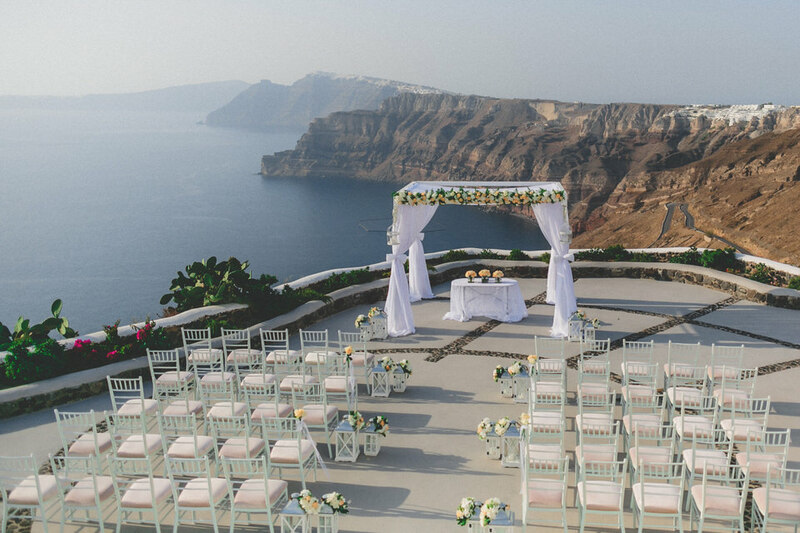 I think every bride will agree with me that this is a dream destination wedding . 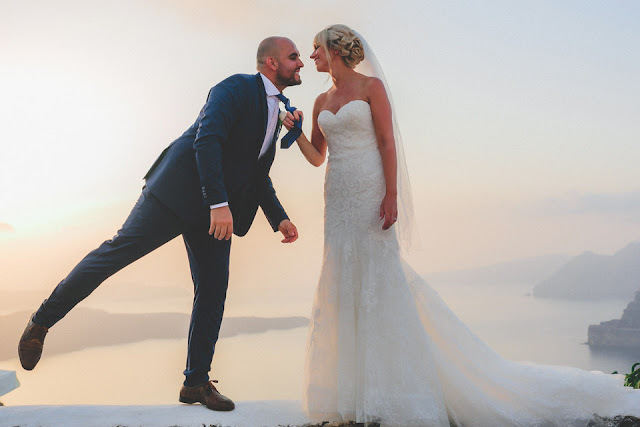 It had it all, beautiful flowers, amazing wedding cake,boat trip in the caldera, beach party with fireplaces, music, dances and a lot of fun and above all a wonderful couple and a sister in law, which was amazing. 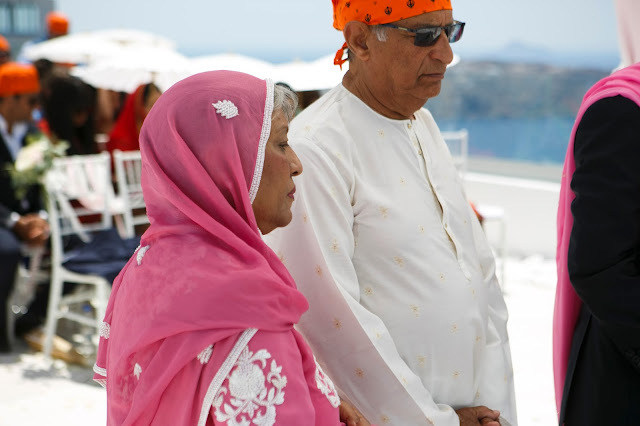 Rita and Ajay is an Indian couple which lives, in the Canary islands. They met through friends. 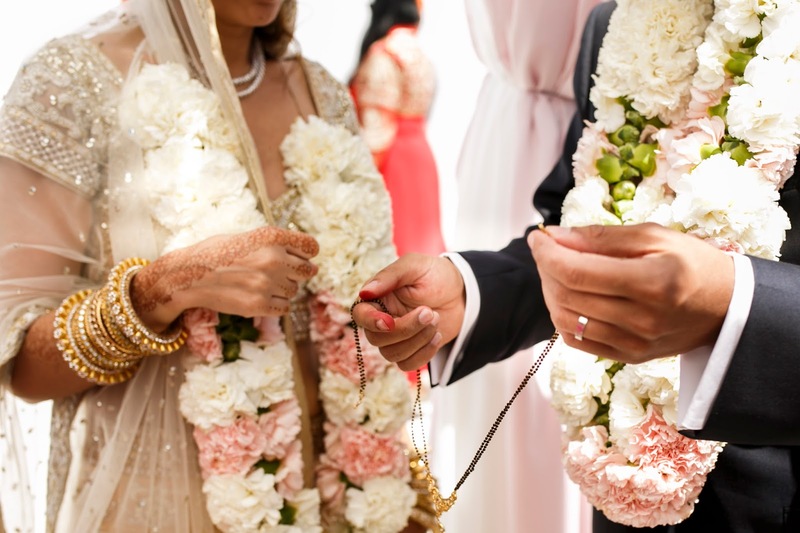 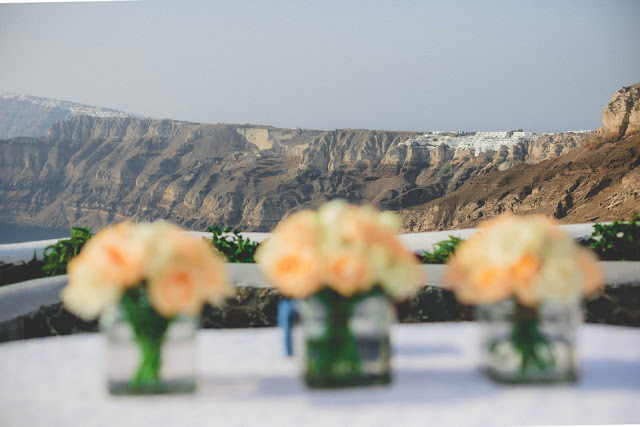 Ajay proposed to Rita in a very traditional way and the length of the engagement was 6 months and their romantic affair ended and at the same time started at the caldera by ending the engagement time and starting a new life. 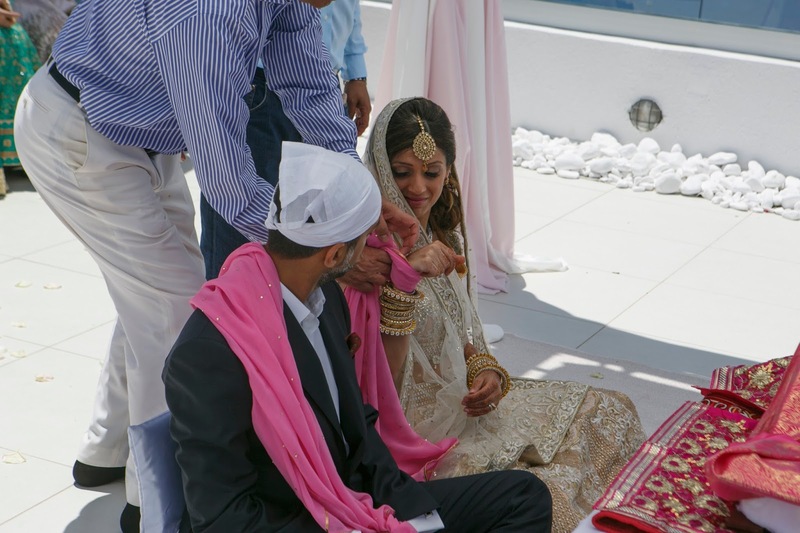 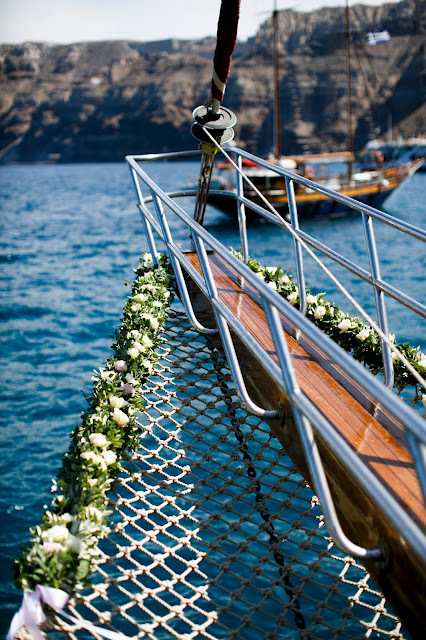 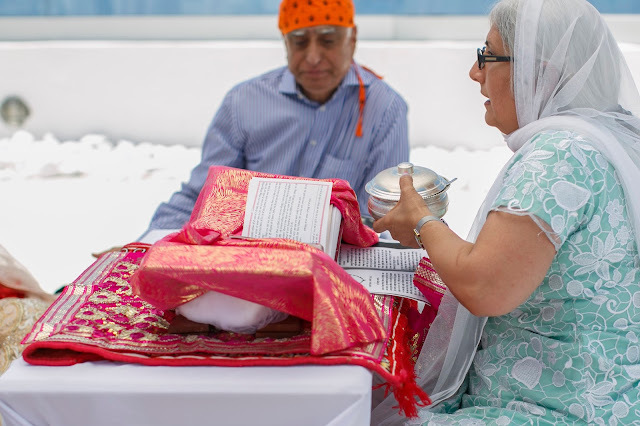 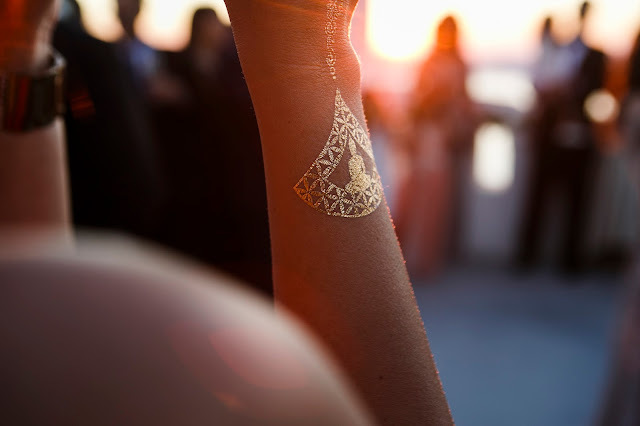 The ceremony took place in Santorini, at Santo winery with a traditional religious Sikh wedding ceremony. 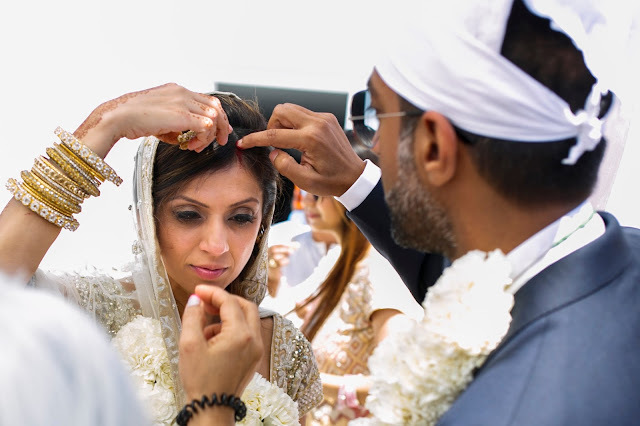 The priest was a woman member of groom’s family. 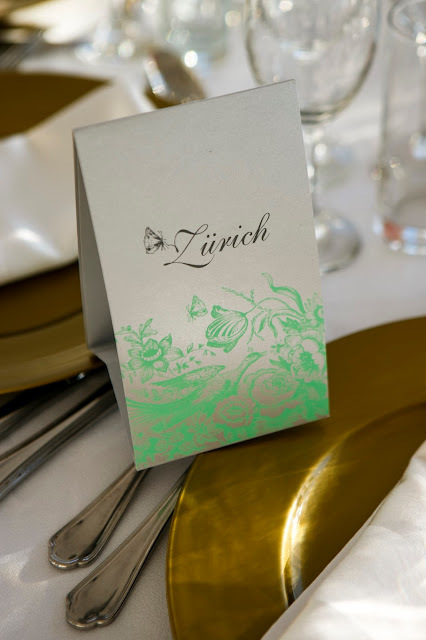 Previously a civil ceremony has taken place in Zurich, where, the bride was staying with family members. 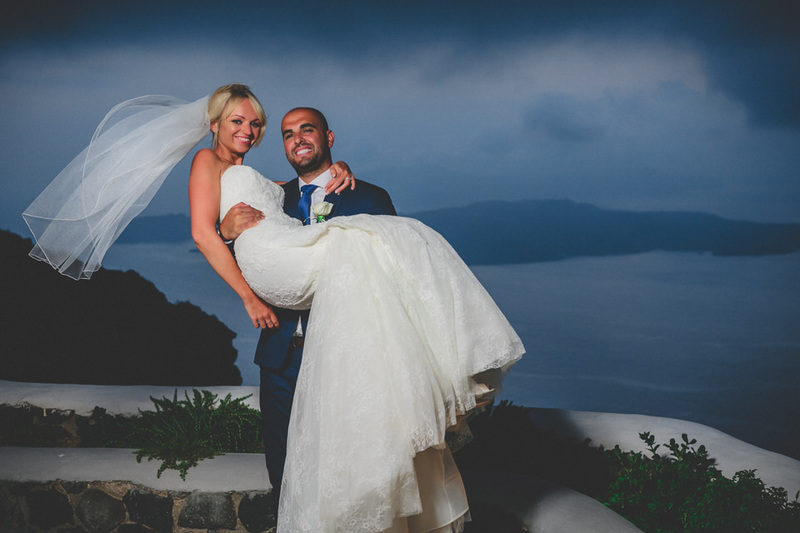 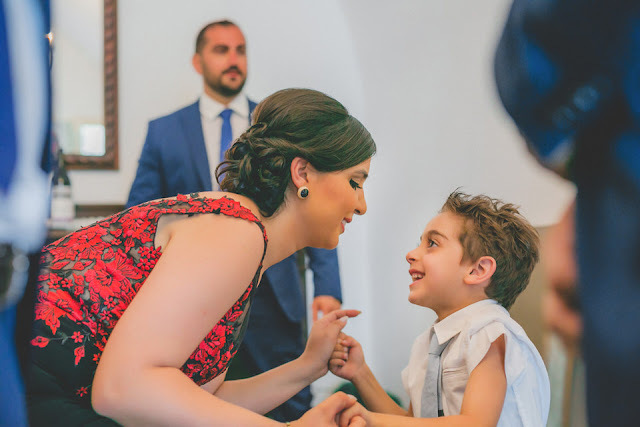 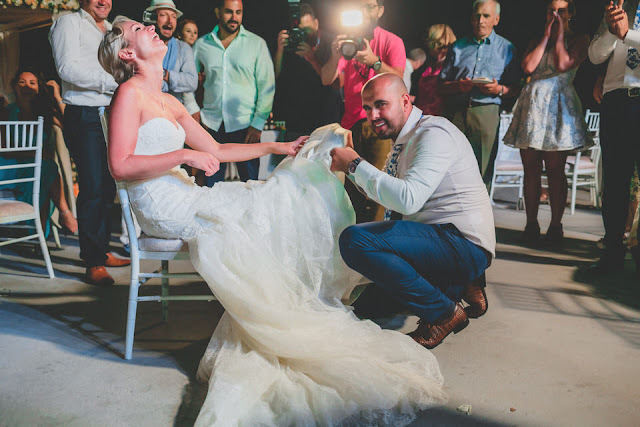 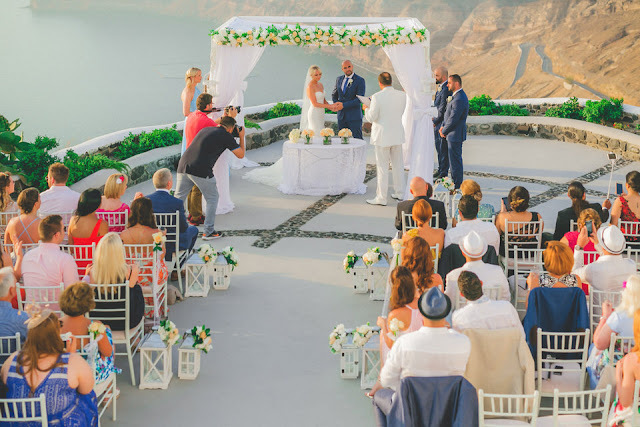 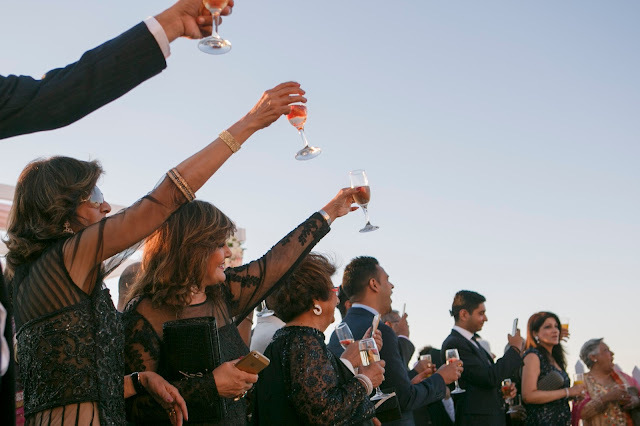 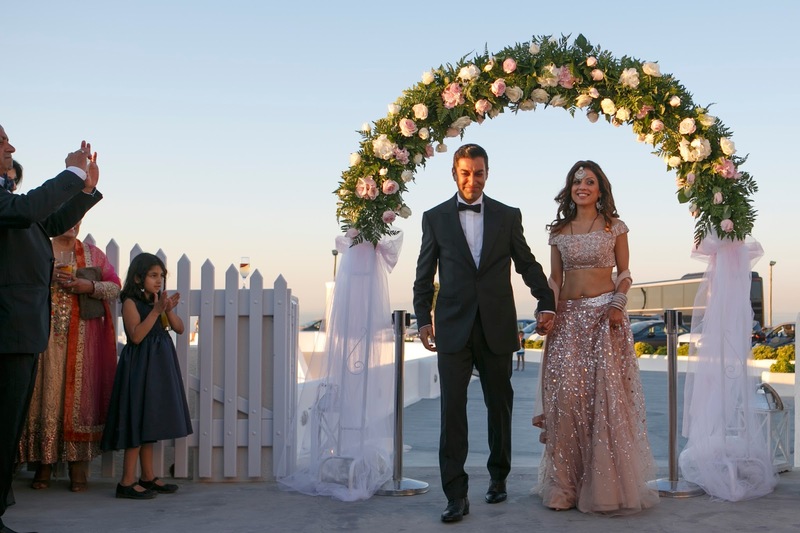 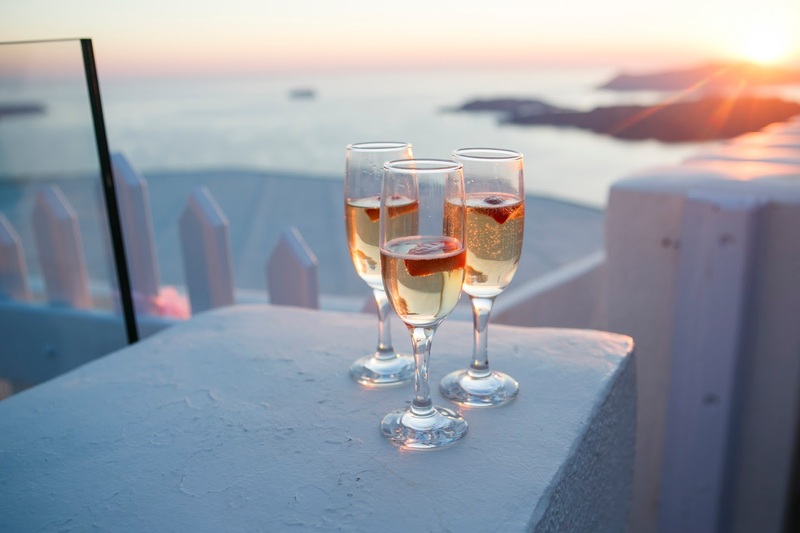 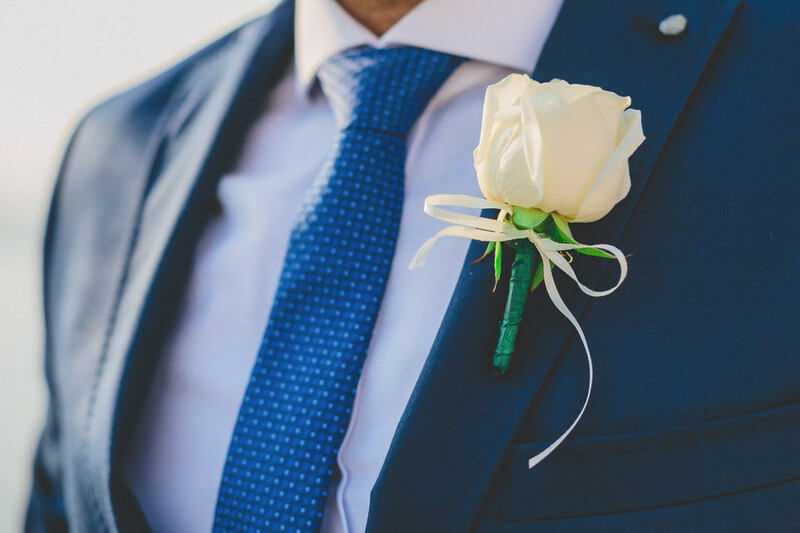 The Santorini wedding ceremony and reception attended around 85 guests and took place at Santo winery, which is an mazing location overlooking the caldera. 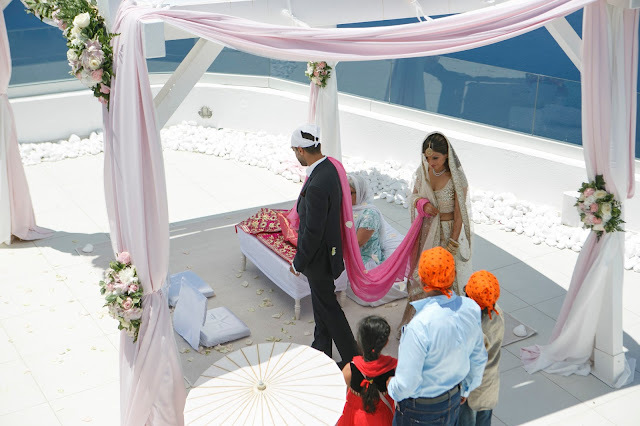 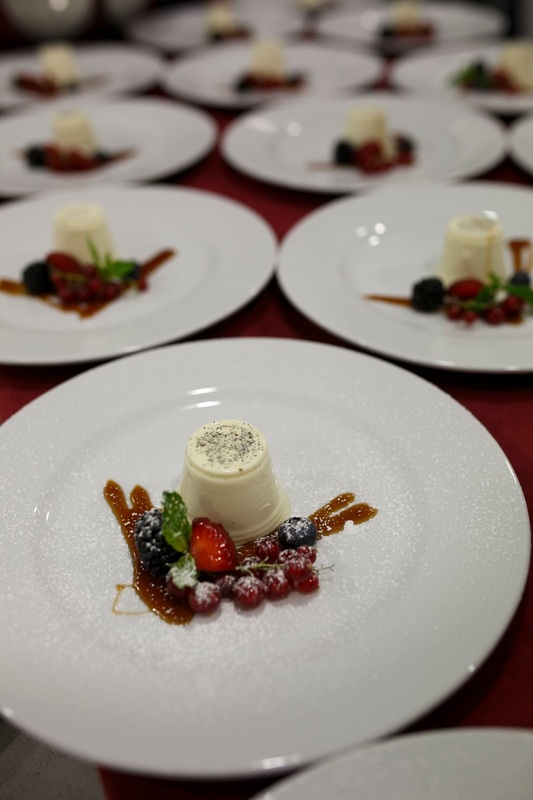 After the Santorini Sikh wedding ceremony , a traditional , homemade sweet was served and some refreshment as alcohol is not allowed after the religious ceremony. 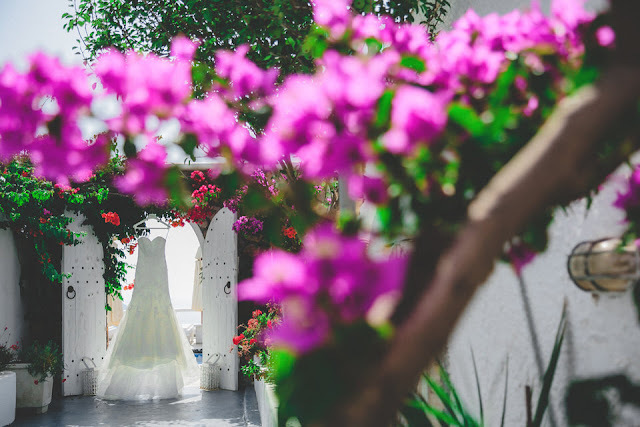 Santo, It was just the scenery the couple was dreaming of bright blue colours, nice weather was to add a special touch to the wedding, as well as the colourful flower decoration design. 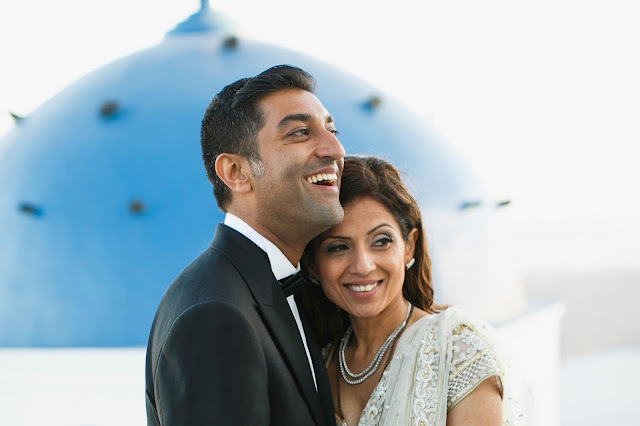 All were dressed in beautiful dresses and the bride in a traditional Indian dress.Then they moved to the reception area and under the sound of Indian music, they start enjoying Mediterranean food. 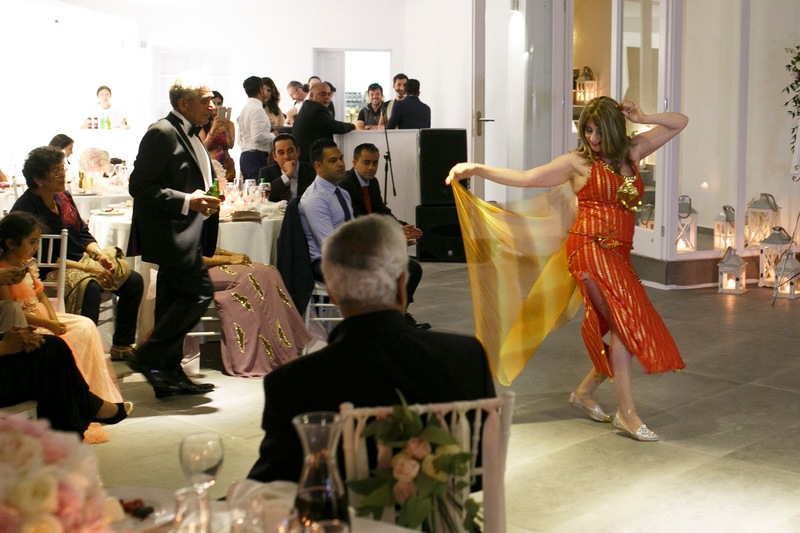 During the reception, there was a lot of fun and there was also some Bollywood dance as well as belly dance. 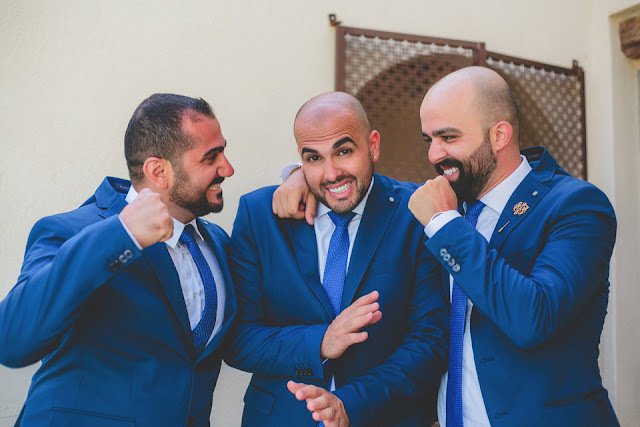 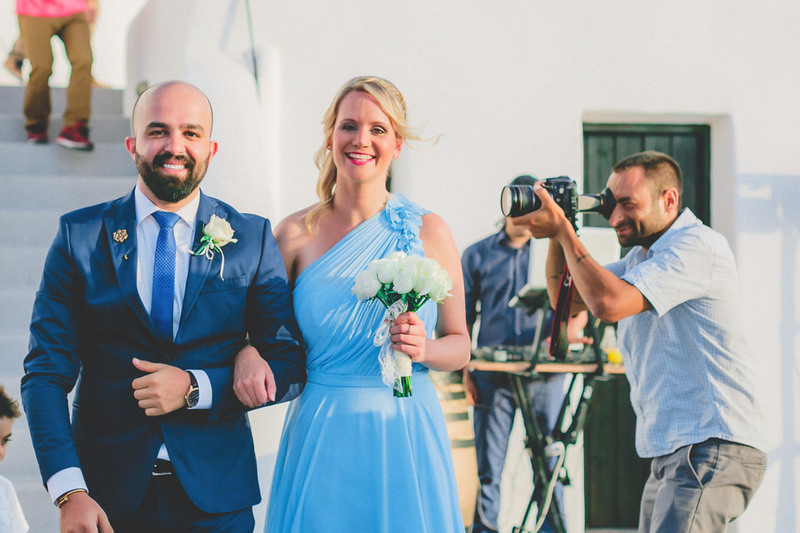 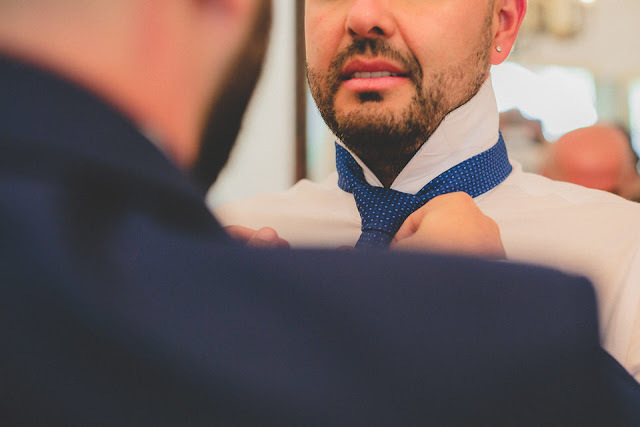 We have chosen Nikos Gogas as our Santorini wedding photographer and he was a recommendation from our Santorini wedding planner Olympia from Marryme in Greece. 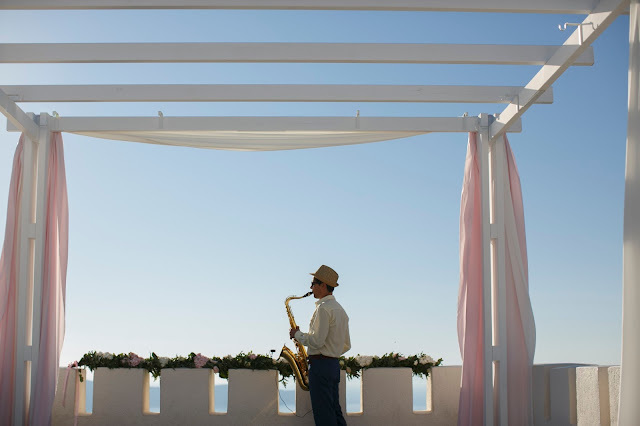 We liked his work and we have seen previous work online, and really liked it; very nice, attentive, and creative. 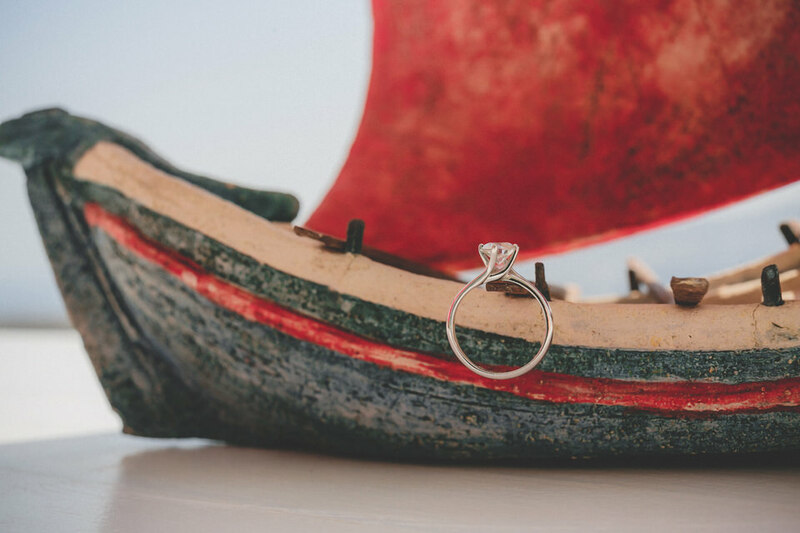 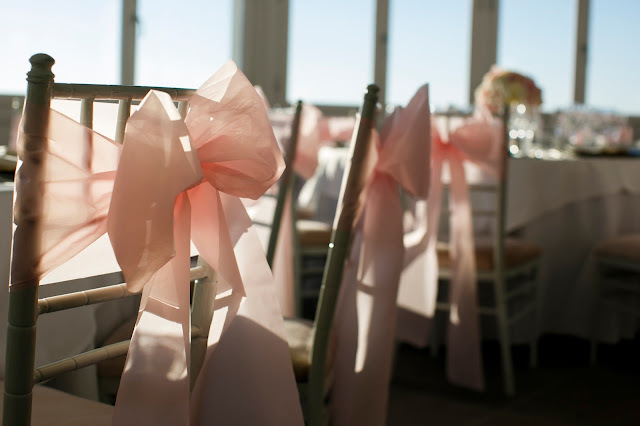 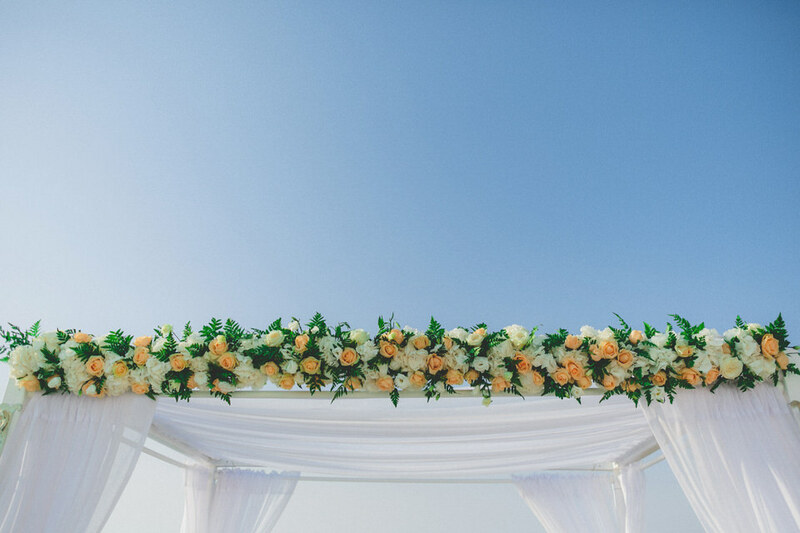 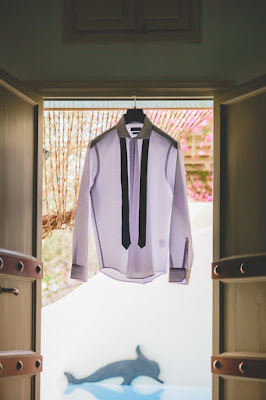 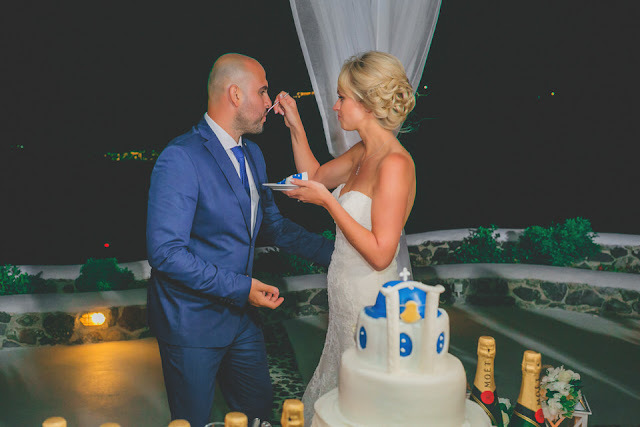 The theme of our wedding was off white and baby pink and Olympia Giannopoulou from Marryme in Greece was involved in all planning in absolutely everything from location choosing and managing suppliers, to arranging transfers and being available on the days to help ! In regards of my wedding dress, I knew the designer when I saw her wear a beautiful dress of her own creation at a party we both attended, there fore she created on for me , and the design was Indian princess with matching earrings, necklace, bangles. 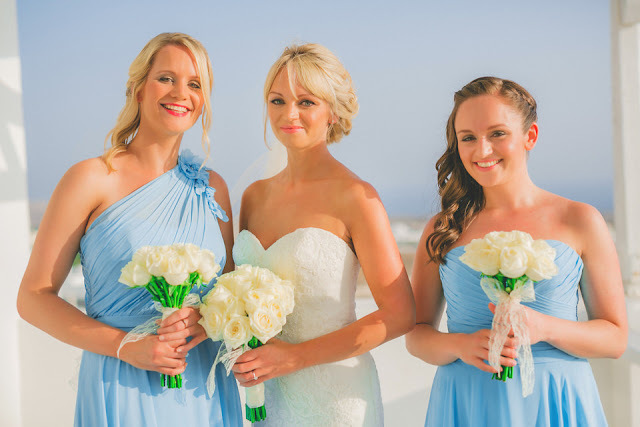 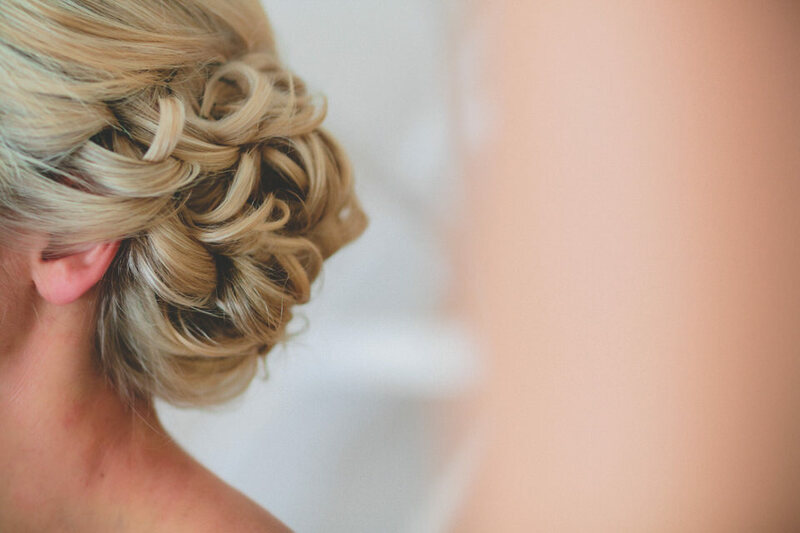 My hair and make up was done from Helen Savva, she was , our wedding planner suggestion. 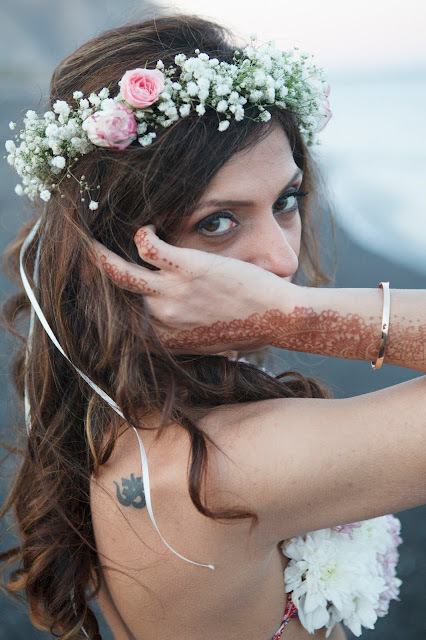 Helen d she absolutely created the perfect image that I wanted to have. 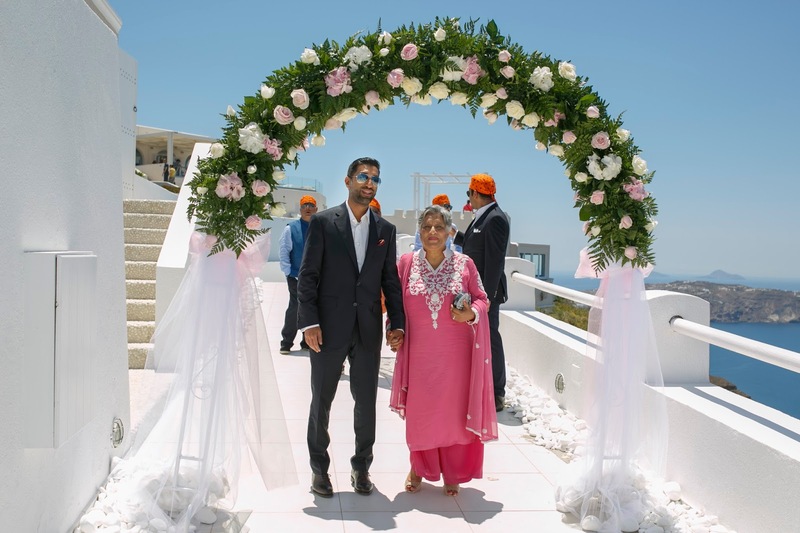 My favourite part of the whole wedding was to be with Ajay and our wedding was unique as it took place in a private , idyllic, scenic place , overlooking the caldera, and the colours of the sunset, under the music of the saxophone first and then our music. 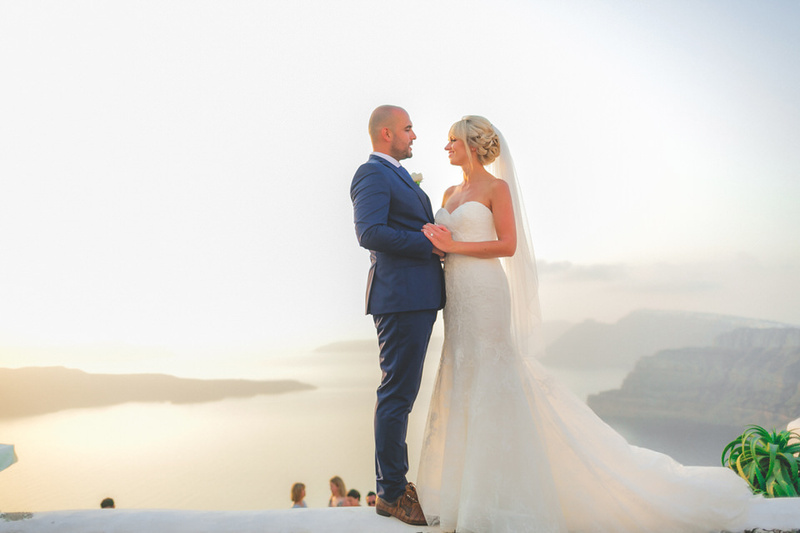 We have chosen Nikos Gogas as our Santorini wedding photographer and he was a recommendation from our Santorini wedding planner Olympia from Marryme in Greece. Our wedding cake was the same colors as our theme, and it was a 3 tier cake and part of it was vegetarian for religious purposes. 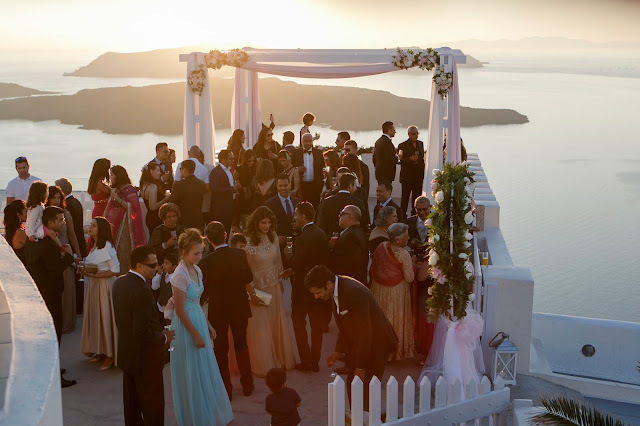 Overall my wedding was like a dream and I want to thank Olympia , that made my dream wedding to become true in Santorini and also all people participating in this wedding.